A lacklustre Arrow wraps up its fourth season with the show's most disappointing episode to date. Considering how much fun last week’s episode was, it’s a crushing disappointment that Arrow Season 4 ends as weakly as it does. In addition to flat-out bungling its most important moments, the finale is riddled with frustrating character decisions and muddled plotting, with even the usually reliable action sequences failing to satisfy. The episode begins where last week’s cliff-hanger left off, with Damien Darhk bursting in on Team Felicity and threatening to kill Donna, unless Felicity gives back the Rubicon codes that will allow him to nuke the entire planet. There’s a horrible moment where it looks like Darhk will actually knock off another cast member, but luckily Thea shows up in the nick of time, threatening to kill Darhk’s daughter (Darhk Jnr), unless he lets them all go. Then, Darhk’s goons arrive and a fight breaks out, during which Curtis is injured, and in the ensuing mayhem, Darhk escapes with the Rubicon codes, meaning the planet is doomed. With Darhk launching 15,434 nuclear missiles, things look pretty bleak for Team Arrow, but Lyla decides to fight back the only way she knows how: by sending a squad of Argus redshirts in to attack Darhk and co. in his lair beneath City Hall. Sure enough, all the redshirts die (with Team Arrow listening in over a comm. link), making Darhk even more powerful into the bargain. Ruh roh! Fortunately, Felicity and Curtis manage to avert the Star City nuke just in time to provide a helpful bit of punctuation to Oliver’s speech, making it look as if hope and togetherness actually did take down the missile. Mind you, we’ve already established that Star City citizens aren’t the brightest tools in the box, so maybe that was Oliver’s plan all along? It isn’t clear exactly where Felicity diverts the missile this time, so let’s hope she doesn’t blow up another entire town that she’ll then immediately forget about, eh? 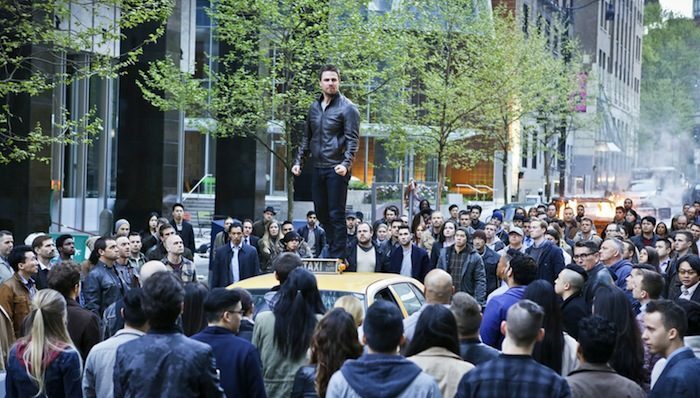 With the nukes averted, Darhk is understandably annoyed (“What does a guy have to do to end the world in peace?”), so he takes the fight to the streets, confronting both Oliver and the people of Star City, who rise up against him in defence of the Green Arrow, like that bit in Spider-Man 2. Oliver and Darhk fight to a standstill, at which point Darhk laughs at him and says he’ll never be able to kill him, seeing as he wasn’t even able to kill the man who murdered his own mother. In answer to that, Oliver kills Darhk the way Darhk killed Laurel (stabbed arrow to the heart), saying that he had a choice with Slade Wilson (oh, Slade Wilson, how keenly your absence is felt), and he doesn’t with Darhk. So Darhk dies. So… that’s it? For all his supposedly magnified power, Season 4’s Big Bad goes out in the most underwhelming manner possible? There are so many things wrong with this entire scene that it’s hard to know where to begin. For one thing, the fighting on the street is very poorly directed and is perhaps the show’s worst action sequence to date. Secondly, the show made a lot of fuss about Darhk gaining power from the dead (hell, that was the entire point of the flashbacks) and even gave us that creepy cliff-hanger a few episodes ago with “I think you’re going to need bigger arrows”, and yet we saw no noticeable increase in Darhk’s powers – if anything, he seemed less powerful, since he didn’t even bother attempting his life-draining moves. If Oliver was supposed to be drawing on the crowd’s hope to defeat Darhk’s magic, which is presumably what they had in mind, then that certainly wasn’t communicated very clearly. The main problem is that it feels like the entire season was building to a point where Oliver realises that – as a briefly returning Amanda Waller spells out in the flashbacks, in case we missed it – “sometimes killing is the only path to justice”. Or that some people are just so flat-out evil that you have no option but to kill them. If that’s the case, then the show already made that point very effectively by having Diggle kill Andy in cold blood (a plot point that is resolved nicely here, by having Diggle confess to Lyla, whereby she forgives him, saying “Fog of War – you did what you had to do”). 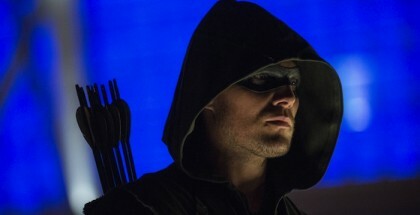 The episode’s title, and a line from Felicity, indicates that the intention is to show there’s a war within Oliver between his light and dark sides, but once again, the show has done very little to illustrate that, particularly this season, which has been all about Oliver fighting in the light and rediscovering hope. It all seems very muddled, thematically, and it doesn’t resonate. Must try harder, show. At least the ending is fairly promising, if only because it appears to acknowledge that the show needs a reset, of sorts. Basically, Team Arrow splits up, with Thea realising that she needs a break from the Speedy thing (prompted by the fact that she was prepared to kill Darhk Jnr earlier) and Diggle, despite having been forgiven by Lyla, apparently leaving his wife, child and Team Arrow in favour of re-enlisting in the military. Similarly, Quentin and Donna drive off into the sunset, now that Quentin is officially suspended from the police force. 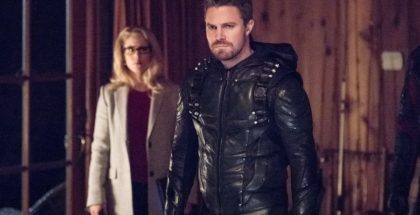 That leaves just Felicity (and Curtis, who presumably isn’t going anywhere) staying behind, which is odd, because the show went out of its way all season to convince us that she needed a break from the whole Team Arrow thing. Again, it really feels like the show just doesn’t know what to do with her at this point, having decided that the romance wasn’t working. Ah, well. I look forward to her sniping from the sidelines next season, as Oliver lines up a succession of new girlfriends. The other promising development is that Oliver finally gets to be Mayor of Star City, fulfilling his comics heritage. It’ll be great if Season 5 focuses on rebuilding the city and brings in a level of progressive social politics, but don’t bet on it. Can we please go back to more villain-of-the-week-style fun, though? Meanwhile, on Flashback Island, Taiana did indeed get possessed by the idol and asked Oliver to kill her, which he did, but not before reiterating his promise to visit her family in Russia, so that’s where we’re headed next season. Oh, and, as mentioned, Amanda Waller showed up, which was nice. All in all, the flashback material has been painfully thin this season, so let’s hope they pay a bit more attention to them next time. All in all, this is a very disappointing end to a season that was patchy but generally enjoyable, with a handful of definite high points. 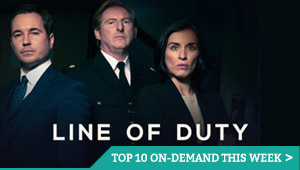 Here’s hoping the show-runners can regroup and get the show back to the form of its second season for Season 5, when it returns in the autumn. Arrow: Season 4 is available to watch online on Amazon Prime Video, as part of a £5.99 monthly subscription. 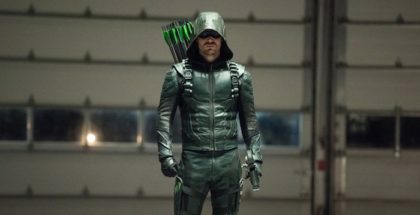 Where can I watch Arrow online on pay-per-view VOD?